St. Paul was born at Tarsus, Cilicia. He was born into a Jewish family who were decedents from the tribe of Benjamin. He was a Roman citizen from birth, and was a young man at the stoning of St. Stephen, and an old man when writing Philemon. This places his birth around the beginning of the Christian era. He was educated in Jerusalem in the strict observance of the ancestral Law. He was trained in the practice of disputation, and returned to Tarsus before the public life of Christ began in Palestine. After the death of Our Lord, St. Paul returned to Palestine. He had a profound conviction that made his zeal develop to a religious fanaticism against the Infant Christian Church. 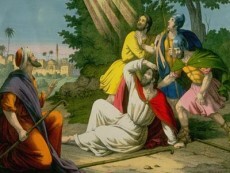 He even took part in the stoning of the first martyr, St. Stephen. He played an active role in the persecution of the Christians that followed. He was commissioned to go to Damascus to arrest the Christians there and bring them back to Jerusalem. He was to heading Damascus, when a light from heaven suddenly blazed around him. Jesus, with His glorified body appeared to him and addressed him, turning him away from his evil ways of persecuting the Christians. St. Paul had an immediate transformation that settled in his soul. In an instant, he was converted heart and soul to the Christian Faith. He was soon baptized and had his name changed from Saul to Paul. He began to travel and preach the faith, to any and all that would listen. We know he became a great Apostle of the Gentiles, and made three missionary journeys, which brought him to Asia Minor and southern Europe. St. Paul has fourteen of his Epistles that are found in the New Testament. We know that he was martyred as an Apostle in Rome around the year 65. He was beheaded in Rome and his body is kept in the Basilica of St. Paul near the Ostian Way. St. Paul was born Saul and was from Tarsus. He was educated in the strict Jewish Law, and did all in his power to violently persecute Christians. He was there and participated in the first martyred Christian, St. Stephen. From that point he worked diligently to persecute the Christians. One day on his way to Damascus, Our Lord appeared to him, and he was instantly transformed. He was baptized and dedicated the rest of his life to promoting Christianity, and became a great Apostle to the Gentiles.